Fantastic product! 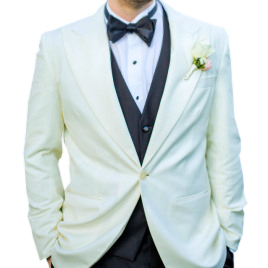 This is the perfect dinner jacket. I tried ordering a suit a year ago at a different online store and the results were disastrous so I was very cautious and concerned about trying again. However, Magnoli Clothiers did an exceptional job. If you have any doubts as to what the jacket will look like? Just watch the first 10 minutes of Indiana Jones and the Temple of Doom. It's an exact reproduction. Trust me, with it on you'll feel like jumping out of a Shanghai night club window... And I mean that in a completely good way!